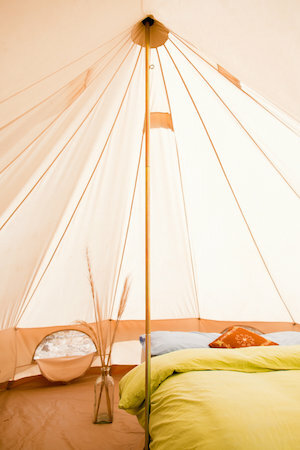 Yoga Tribe — Tipi Valley is an ecological surf and yoga retreat in the western Algarve, Portugal. Positioned close to our own organic gardens and close to the yoga deck lies our Yoga Tribe option: a simple yet comfortable tent that is private and protected from any wind at night. With comfortable bedding, a larger bed and excellent privacy, this tent is just a short stroll from the centre of the camp. A peaceful and restful night awaits.